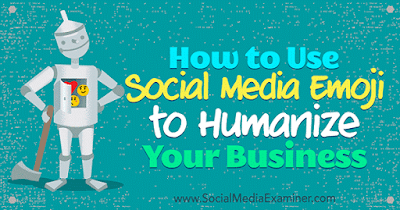 Do you want to humanize your business on social media? Have you thought about using social media emoji? Emojis are a fun and creative way to connect with your customers on a more personal level and show your brand’s personality. 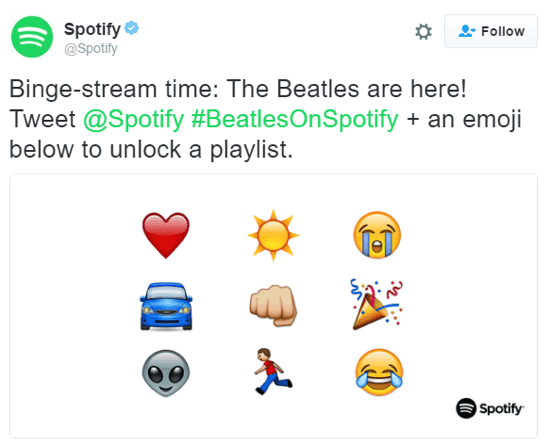 In this article, you’ll discover how to use emojis in your social media marketing. 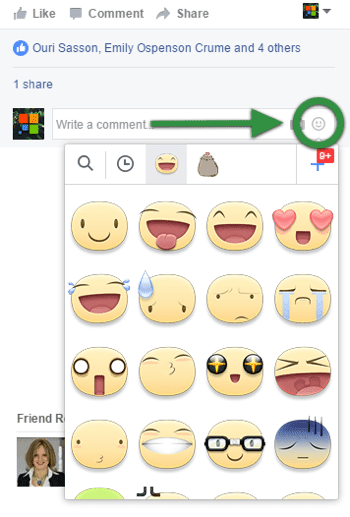 Facebook is one of the biggest adopters of emojis in one form or another. 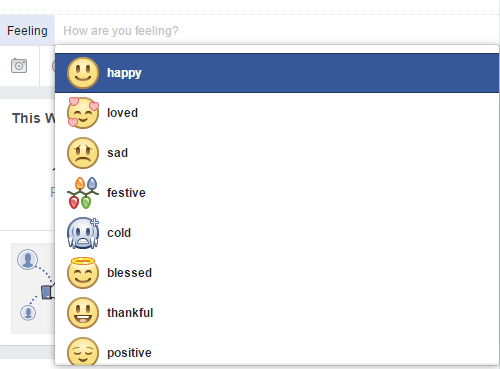 You now have myriad ways to tell others your current mood, from emojis to feelings and reactions. 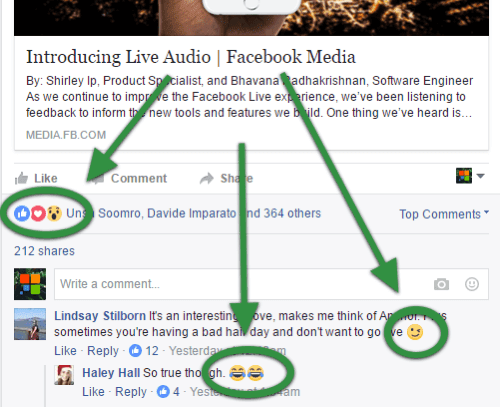 Businesses are using emojis on Facebook to respond to customer comments, convey a clear emotion, and speak their customers’ language. 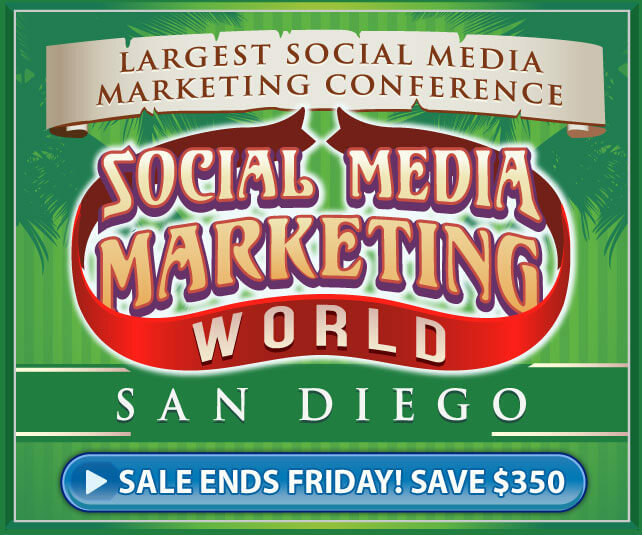 They can help make customers feel like your company listens and cares. But even before companies had the option to Choose a Feeling or Post a Sticker, they were turning to Facebook for creative emoji marketing solutions. 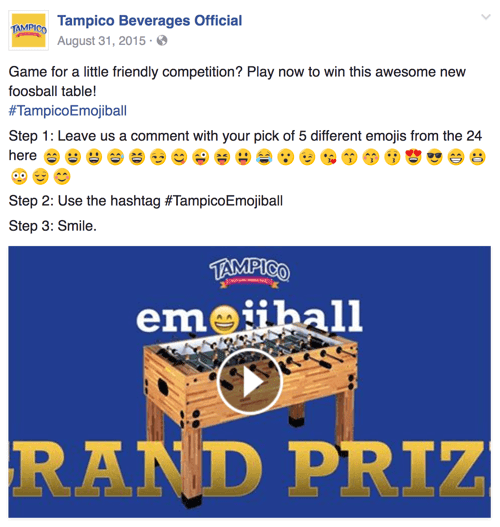 For example, beverage company Tampico created a social media game called Emojiball. Users were given a choice of 24 emojis and had to post five of them with the #TampicoEmojiball hashtag to play. People who guessed the correct emoji combination won a prize. Tampico spread the word about Emojiball primarily through Facebook and Twitter, and enjoyed unprecedented user engagement as a result. While you’re brainstorming ways to use emojis for your Facebook marketing campaigns, here’s tips on how to post different emojis. To share how you’re feeling in an update, click the smiley face icon in the bottom left of your update. 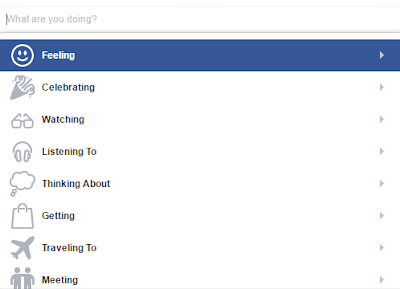 Then select Feeling from the drop-down menu. Finally, choose an emoji that reflects how you feel about your post. Another type of Facebook emoji called meeps are highly expressive Facebook stickers. You can use meeps the same way you would use any emoji. To post a meep, click the smiley face icon beside your comment and select your favorite meep. Remember that an effective emoji marketing campaign should make your ads or posts clear, not difficult to decipher. Trying to force emojis where they don’t belong is a bad idea. At best, you’ll confuse your customers. At worst, you might drive them away. Don’t underestimate the power of emojis to connect with your audience on Twitter. 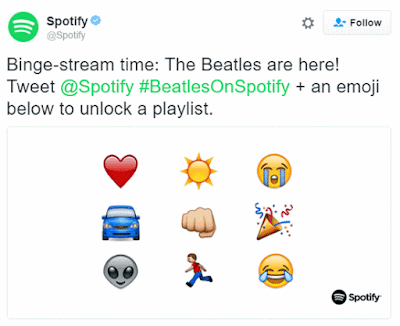 Brands, publishers, and people have tweeted more than 110 billion emojis since 2014. And now that Twitter advertisers can target people who have engaged with particular emojis, there are even more marketing opportunities on the platform. Why are emojis so popular on Twitter? With only 140 characters to work with, emojis let you put into practice the old saying “a picture’s worth a thousand words.” Don’t waste characters typing out a complicated emotion when you can convey it with an emoji instead. 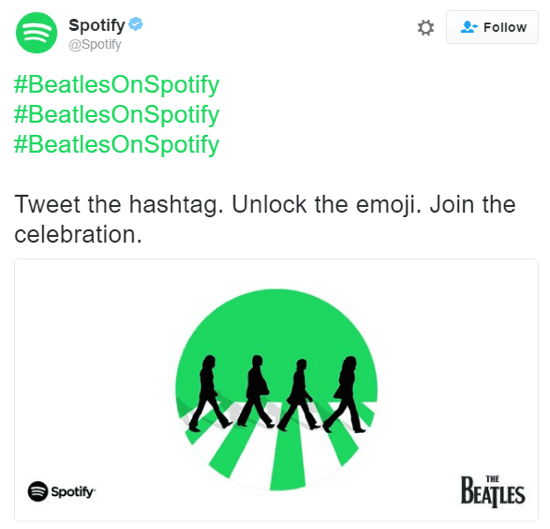 When the Beatles catalog launched on Spotify, Spotify developed fun ways for their followers to celebrate the Beatles with emojis. Greatly influenced the 6.5 million listeners in the first 100 days of the catalog. Made #BeatlesOnSpotify 4x more popular than #Beatles during the launch. Gave Spotify an 83% share of the conversation at launch, even though seven other streaming services also released the catalog. 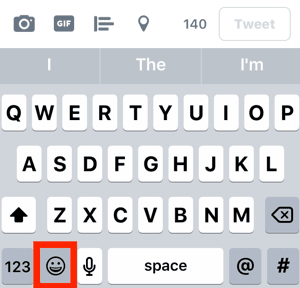 To post an emoji to your tweet on mobile, tap the globe or smiley face icon next to the 123 key in the bottom-left of your keyboard. Then choose the emoji you want to add. Remember that an emoji counts as a character in your tweet. 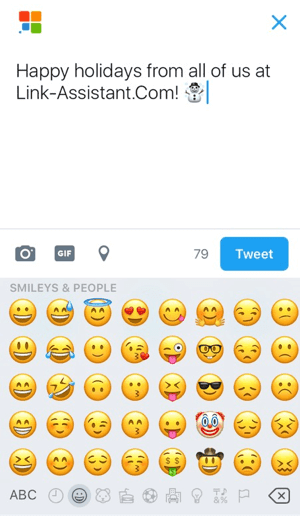 You can post emojis to Twitter via your desktop computer if you know the appropriate shortcut. Or visit a site like Get Emoji to copy and paste any symbol you desire. It’s a lot easier than trying to remember the shortcuts for the more than 1,100 emojis Twitter now supports. Instagram might be all about photos and videos, but if you take a peek at the comments, you’ll probably notice that emojis reign supreme. While emojis are a fun way to encapsulate a sentiment such as “Wow!” or “I love this!”, they’ve also been used in some unexpected and downright clever marketing. The superhero movie Deadpool used emojis in both their roadside advertising and social accounts. On Instagram, @deadpoolmovie released a series of Deadpool emojis so fans could share their feelings with their favorite wisecracking, smart-mouthed superhero. Even if creating your own emojis is not the right strategy for your business, that doesn’t mean you can’t have some (comparatively simple) fun by adding some emotions to your replies. 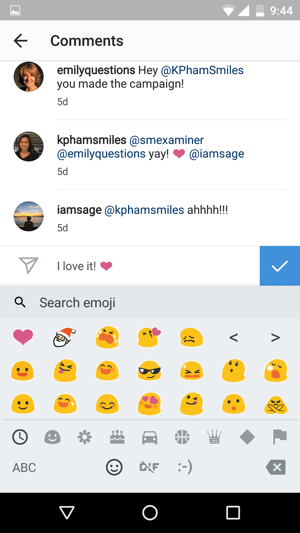 Adding emojis to your Instagram comments is easy. In fact, on many mobile devices, this functionality is automatically enabled. Simply tap the smiley face or globe icon on your keyboard and tap the emoji you want to use. If you don’t see the option to add emojis on Instagram and you’re running iOS 5 or iOS 7, go to Settings and tap General. Then scroll down and tap Keyboard > Keyboards > Add New Keyboard > Emoji. Now when you’re typing a comment and want to add an emoji, tap the smiley or globe icon that appears beside the 123 key. Choose the emoji you like and fire away! If your device is on Android 4.1 or higher, it probably comes already equipped with emojis. To activate them, go to Settings and tap Language and Input. Go to Android Keyboard or Google Keyboard (whichever one you see). Then tap on Settings and scroll down and tap Add-On Dictionaries. Finally, select Emoji for English Words. Now that it’s installed, you can use emojis anytime. When you’re typing a comment and want to add an emoji, tap the smiley face beside the 123 key. Pick your favorite emoji and you’re done! Not only are emojis a great way to add personality to your Instagram comments, they also have the potential to be much more. Creating a clever and memorable ad campaign around emojis can be fresh and funny, and has the potential to be pure marketing gold (as long as your brand messaging is consistent). A word of caution: If you do decide to get creative and make a custom emoji pack for your followers, make sure that your followers are demanding custom emojis and your emojis are relevant to your campaigns. Emojis can feel like an alien language, especially if you’re not in the habit of greeting good news with a cartoon smiley face or celebrating Oktoberfest with a pixelated beer stein. 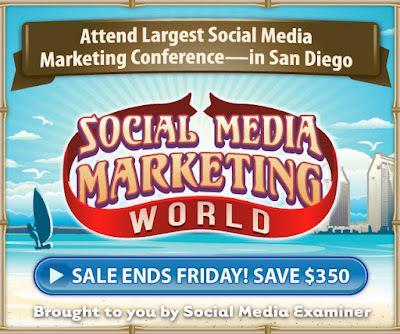 And to the cynic, using small pictures instead of text is a fad that’s doomed to fizzle out. But even if you aren’t using emojis, your customers and your competitors are. Appboy’s latest study found that marketing campaigns with emojis have increased 777% year-over-year and continue to rise by 20% every month. So how do you reach such a large emoji-using audience? By learning to speak their language, and understanding the meaning behind different emojis. Today, brands worldwide are using emojis to connect with their audience on a more personal level than ever before. What do you think? Does your business use emojis in your social media outreach? 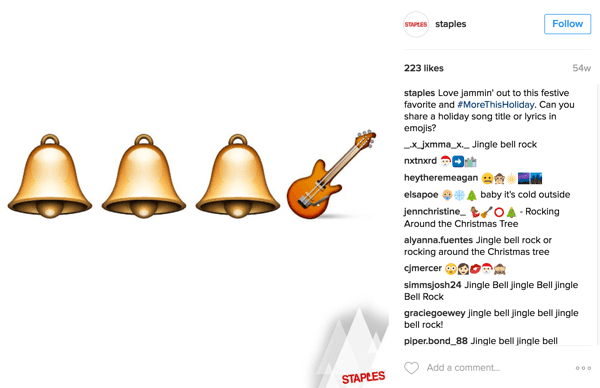 Do you think emojis will see more marketing use and even bigger growth in 2017? Share your thoughts in the comments below!